Are you interested in web archives? What’s in a (top-level) domain name? I think there would be general agreement amongst web archivists that the country code top-level domain alone is not the whole of a national web. Implementations of legal deposit for the web tend to rely at least in part on the ccTLD (.uk, or .fr) as the means of defining their scope, even if supplemented by other means of selection. However, efforts to understand the scale and patterns of national web content that lies outside national ccTLDs are in their infancy. An indication of the scale of the question is given by a recent investigation by the British Library. The @UKWebArchive team found more than 2.5 million hosts that were physically located in the UK without having .uk domain names. This would suggest that as much as a third of the UK web may lie outside its ccTLD. And this is important to scholars, because we often tend to study questions in national terms – and it is difficult to generalise about a national web if the web archive we have is mostly made up of the ccTLD. And it is even more difficult if we don’t really understand how much national content there is outside that circle, and also which kinds of content are more or less likely to be outside the circle. Day to day, we can see that in the UK there are political parties, banks, train companies and all kinds of other organisations that ‘live’ outside .uk – but we understand almost nothing about how typical that is within any particular sector. We also understand very little about what motivates individuals and organisations to register their site in a particular national space. So as a community of scholars we need case studies of particular sectors to understand their ‘residence patterns’, as it were: are British engineering firms (say) more or less likely to have a web domain from the ccTLD than nurseries, or taxi firms, or supermarkets? And so here is a modest attempt at just such a case study. All the mainstream Christian churches in the island of Ireland date their origins to many years before the current political division of the island in 1921. As such, all the churches are organised on an all-Ireland basis, with organisational units that do not recognise the political border. 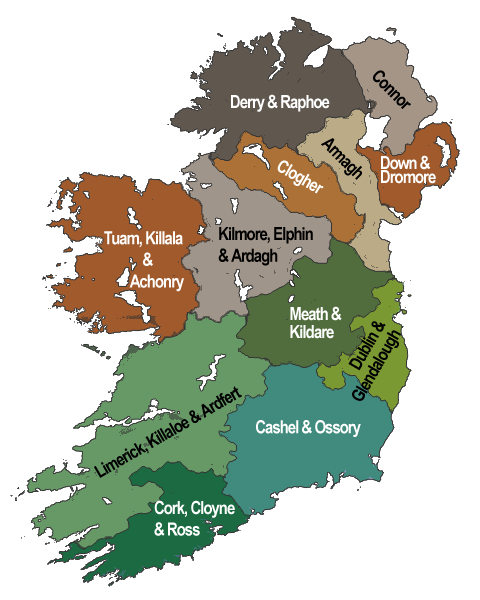 In the case of the Church of Ireland (Anglican), although Northern Ireland lies entirely within the province of Armagh (the other province being Dublin), several of the dioceses of the province span the border, such that the bishop must cross the political border on a daily basis to minister to his various parishes. How is this reflected on the web? In particular, where congregations in the same church are situated in either side of the border, where do their websites live – in .uk, or in .ie, or indeed in neither? In sum, less than half of these sites – of church congregations within the United Kingdom – are ‘resident’ within the UK ccTLD. A good deal of research would need to be done to understand the choices made by individual webmasters. However, it is noteworthy that, for Protestant churches in a part of the world where religious and national identity are so closely identified, to have a UK domain seems not to be all that important. 1. My initial list (derived from one published by the PCI itself) represents only sites which the central organisation of the denomination knew existed at the time of compilation, and there are more than twice as many congregations as there are sites listed. However, it seems unlikely that that in itself can have skewed the proportions. 2. For the very small number of PCI congregations in the Republic of Ireland (that appear in the list), the situation is similar, with less than 30% of churches opting for a domain name within the .ie ccTLD. However, the number is too small (26 in all) to draw any conclusions from it.